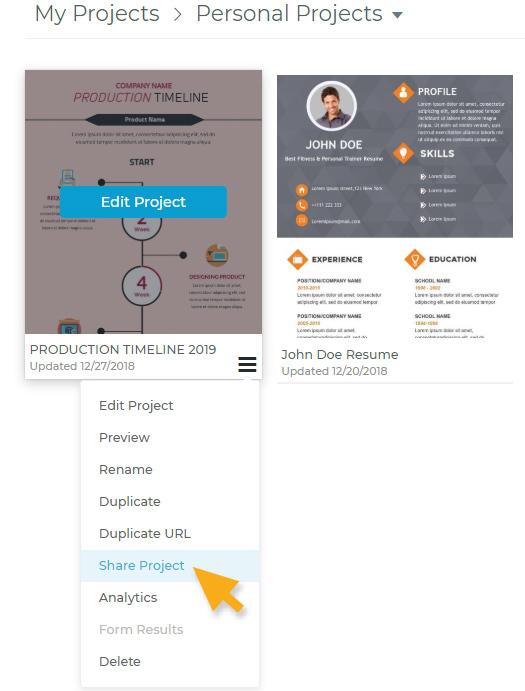 Visme allows you to share content with other users (available under Visme Team plans) and also allows you to set permissions to certain projects or folders. For example, an organization may be composed of 2 or more users or groups of users, or a combination of both. All users can collaborate as a team and share content depending on permissions set by administrator(s). In short, Visme for Teams allows you to share one or more projects/folders with other users in your Team. The Administrator can set certain users to view and/or edit the project. – Create a project that serves as a template so other users can use it and create new content from it. – Start a project (a Presentation or an Infographic for example) and let another user take over and finish it for you and/or make adjustments. 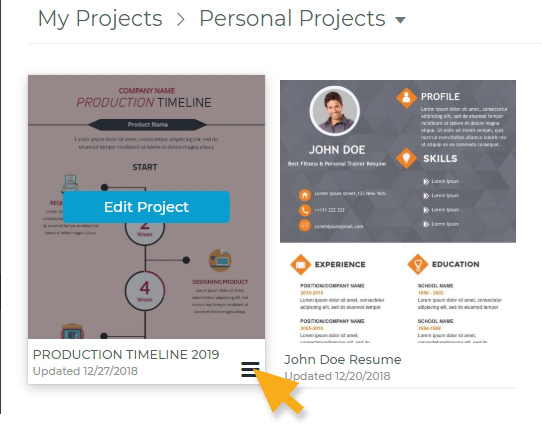 You can share projects individually or you can organize projects into a folder and share folder(s) and its contents with other users in your team. From the Dashboard, hover your mouse to any project you want to share and click on the menu icon from the bottom left corner of that project. Select Share Project from the dropdown to open the sharing option. 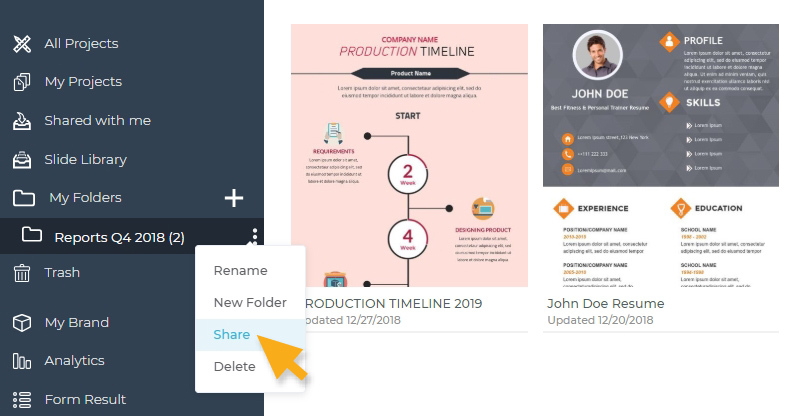 Or if you want to share an entire folder, select a folder (left panel) that you have created and click Share in the dropdown. 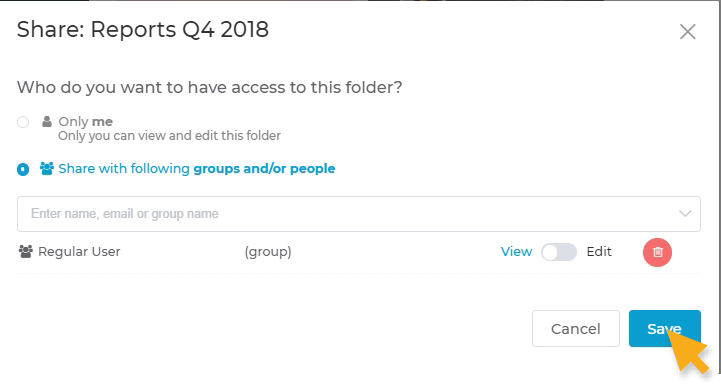 There are two options for sharing: 1) Only Me (which is the default option) and 2) Share with the following groups and/or people. 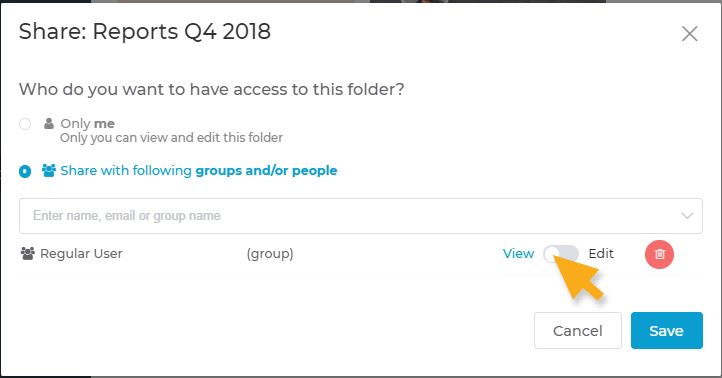 To share with groups and/or people, select Share with the following groups and/or people and click on the + button on the right to open the list of groups and users present. Tip: You can scroll down the list to select the Group or scroll further down to see the list of your users. Note: You will need at least 2 or more users to be able to share it with others). There are two options you can set. 1.) Can edit and 2.) Can view. The Can edit designation means that the user/group can edit the project(s) you have assigned to them. The can view designation means the user/group can only view the project from their login area but they cannot edit the project. In this case, we’ve set Regular User to can view, therefore the user cannot edit or change something on the presentation that is shared but can view it. Once you are satisfied with the settings, click Ok to apply your sharing options. 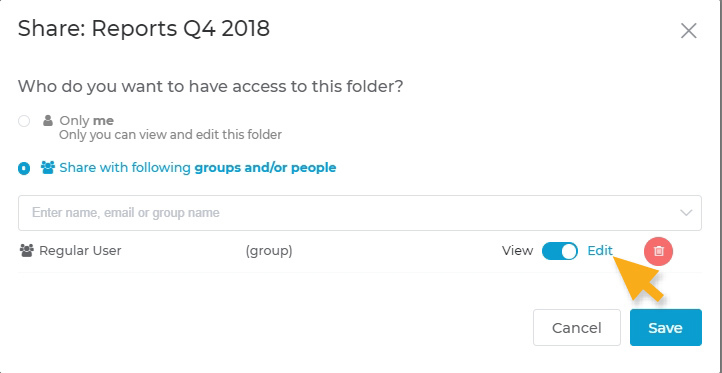 This will now allow your project/folder to be shared with specific group(s) and/or users the next time they login to their account. To learn more about Team plans and what it can do for your organization, click here. Do you want to add more users to work as a team? 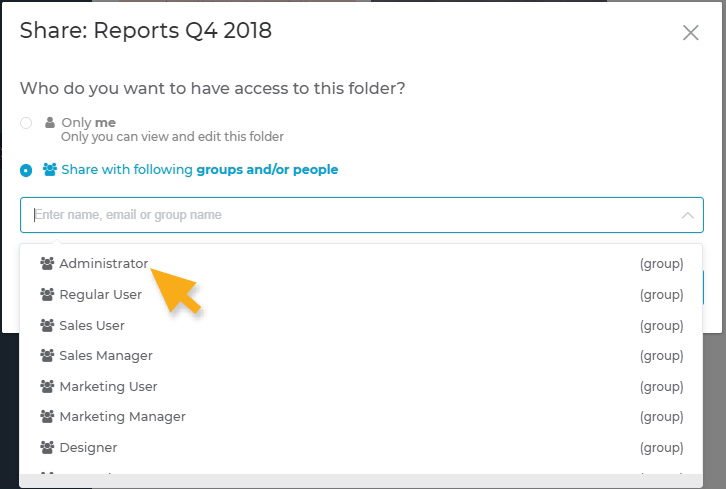 You can add more users by logging in and going to Account Settings > Manage Users and look for option to add more users. For Enterprise team plans, contact visme support.